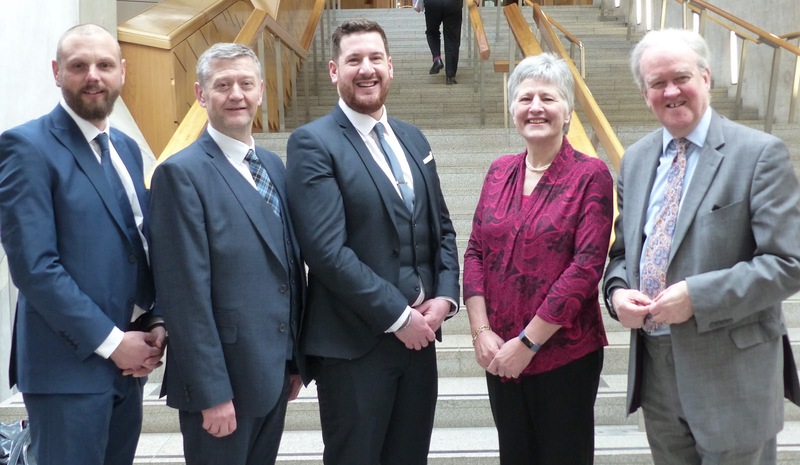 Banffshire & Buchan Coast MSP Stewart Stevenson has welcomed a Pastor from his constituency to deliver ‘Time for Reflection’ in the Scottish Parliament. Pastor Rob McArthur and colleagues from Banff’s River Church met with Mr Stevenson for lunch in the Parliament before speaking to MSPs in the Chamber. “It was a great pleasure to nominate Rob McArthur to deliver Parliament's 'Time for Reflection' and to welcome him to Holyrood. “He is a well-known and respected figure in the community. Pastor McArthur spoke eloquently about the recent unity service he arranged as part of a team at Banff Bridge. 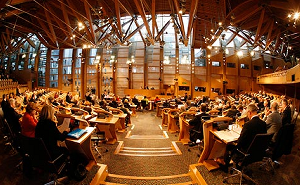 “Presiding Officer, elected members of the Scottish Parliament, it is an absolute honour to be with you this afternoon. “One thing that I love is being with my wife and four children. Times together as a family are a high priority for us. There is something about being together in heart and mind that makes us stronger. Is it not true for us all that making time to be with family and friends is good for us? “Nine years ago, I dedicated my life to Jesus and I chose to bring my heart and mind into alignment with his purposes for my life. That was not in my life plan, but God’s plans are always better than ours. “Recently, I was part of a team that organised a unity service for remembrance Sunday. We decided that the best location for the service would be the connecting area of our two towns, Banff and Macduff—the Banff Bridge. During the service, which more than 500 people attended, I asked folks to come together and to link arms, in order to make a human chain across the bridge. It was a beautiful symbol of local unity and there was such a sense of togetherness. “However, in the early stages of preparation for the service, we had many doubts as to whether people would come. We had to challenge our thinking and replace our “as ifs” with “what ifs”—going from, “As if this could work,” to, “What if this could actually work?” That was a powerful shift in our minds. As a small group, we had to think big. “I wonder what could happen if we, as a people, asked “what if” questions rather than the negative “as if” questions. What if God could use us, as a people, to do great things for this nation? What if he actually listens to our prayers and wants to help us? What if we believe that God is for us and not against us? “It was one thing to have a physical bridge connecting our two towns; it is quite another to have people connecting hearts in fellowship and relationship. Hearts that are connected are stronger together. “My prayer is that, in the year ahead—for each one of us who is here and for those people who cannot be with us—we, as a people, think big, that we have hope and think “what if”, and that we remind ourselves that the Lord Jesus is absolutely for us.